Albert was born in 1896, the son of George Thomas Crosswell and his wife Mary, née Salter. Albert was their second child, but the first to survive infancy; his elder brother, George Thomas born in 1893, died very soon after he was born. Albert’s younger siblings were Lilian Maud (born 1897), Francis George (1898), Charles James (1900), Walter Henry (1903), Arthur John (1904), Winifred May (1907), and Stanley Robert (1909). 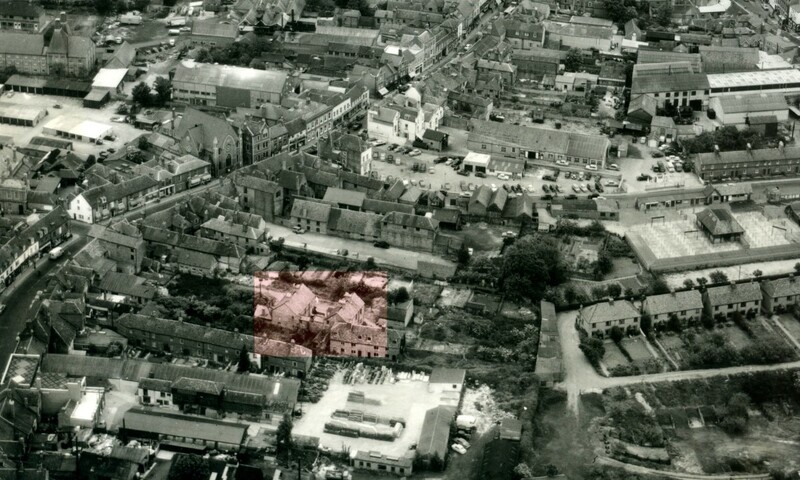 The family lived at 5 New Square, a small group of houses behind the east side of Bartholomew Street. There were no further children because their father died in 1910, leaving Mary with seven children to raise alone. It was precarious employment, boys were paid at 6d an hour, but there was no pay while waiting for a call to a job – boys would only take on this if they were unable to find permanent employment. Perhaps it was the military influence of the Gordon Boys that persuaded Albert that he would like the soldier’s life? 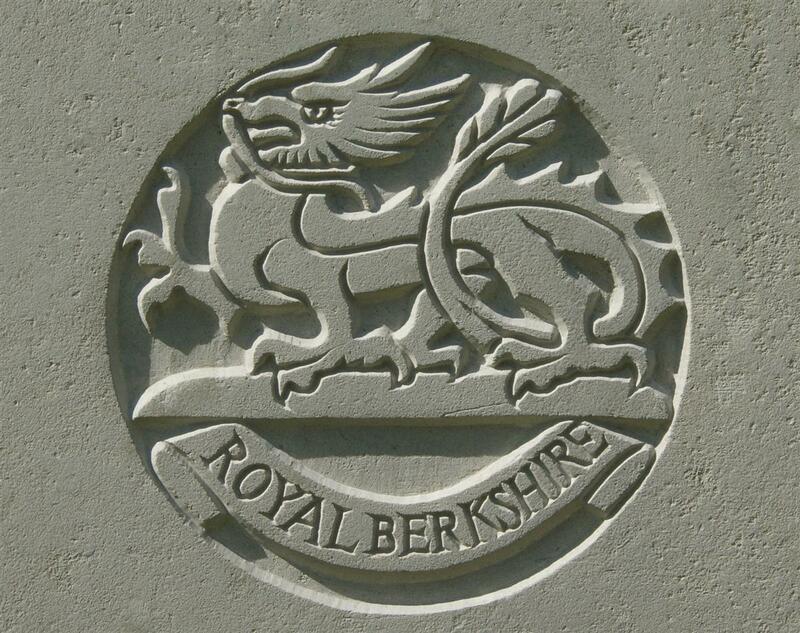 Whatever the reason he enlisted into the local infantry, the Royal Berkshire Regiment, on 25 March 1914. When war was declared in August he was still in training so he was not among the ‘Old Contemptibles’ who fought the battles of Mons, Le Cateau, Marne and 1st Ypres; he did cross to France in 1914, but not until 17 December, thus failing to qualify for the award of a 1914 or Mons Star (awarded to men at the front before 23 November 1914) – he was, however, awarded the 1914-15 Star. He was sent to France among a draft of replacements for the 2nd Battalion, Royal Berks. The battalion’s war diary does not record the arrival of replacements but it could take anything from hours to a few weeks for men to reach their unit after landing in France. For over a year Albert served with the battalion, for the most part through the dreary routine, a few days in the line, a few days in reserve or support, and a few days in billets while training or toiling away in working parties. Throughout 1915 and into 1916 the 8th Division was in the same area of the front, north of Neuve Chapelle; the most active part of the front through 1915, where the battles of Neuve Chapelle, Aubers Ridge, and Festubert took place; the 2nd Royal Berks were heavily involved the first two of these suffering very heavy losses. The battalion was not directly involved in the largest action of the year – The Battle of Loos – but did take part in a diversionary action at Bois Grenier on 25 September, once again taking many casualties. Albert survived all these battles – though he may well have received a minor wound, without his service record (lost in a fire in 1940) it is impossible to tell. In trenches near CROIX BLANCHE. 5 men wounded, 1 man from hospital. One of the wounded was Albert. He was evacuated to a dressing station in Fleurbaix, a short distance behind the lines where he died the same day. CROSSWELL – Feb 12, Somewhere in France, Pte A Crosswell, 2nd Royal Berks Regt, eldest son of the late George and of Mrs Crosswell, 7, New Square, Bartholomew-street, aged 20 years. Mrs Crosswell, of New-square, Newbury, has had the painful news of the death of her son, Pte A Crosswell, of the 2nd Royal Berks, who was killed in action on February 11 “Somewhere in France”. The official report has no reached her, but two of his soldier friends have forwarded the news. Pte Crosswell met his death instantly, and therefore suffered no pain. His friends say he was much liked by his comrades, and he died a hero’s death. Albert’s well-meaning mates tried to save his family unnecessary pain that might have arisen from the knowledge that his death was in all probability painful and protracted over a few hours. 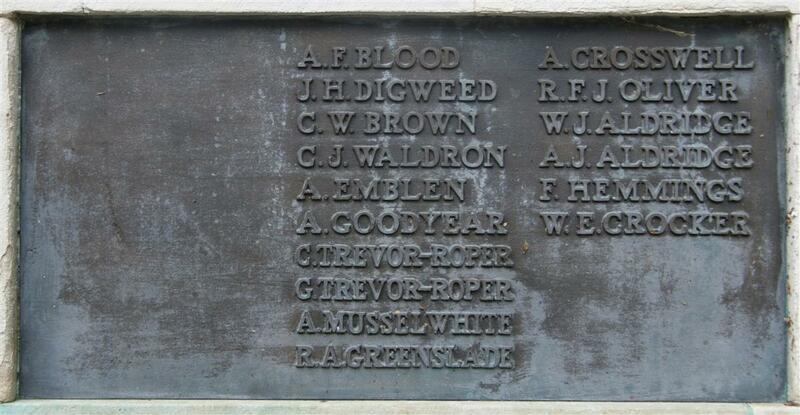 Albert's name on Newbury War Memorial. He was buried in grave II.J.8 at Rue-Petillon Military Cemetery, Fleurbaix . This cemetery served the dressing station, where Albert died. In 1922 his name was included (on tablet 8) when the Newbury Town War Memorial was unveiled; he is also remembered on the memorial board and roll of honour in St Nicolas Church, Newbury. The Croswell family were luckier than many in that only three of the children were old enough to serve during the war. Of these Charles James Crosswell was not 18 until 1918, when he would have been called up; but the British had a policy of not sending men to fight until they were 19. This policy was amended to 18½ in mid-1918 when the German spring offensive stretched the forces in France almost to breaking point. But the change did not affect Charles, by the time he reached 18½ the war was over – he would not have had to fight. 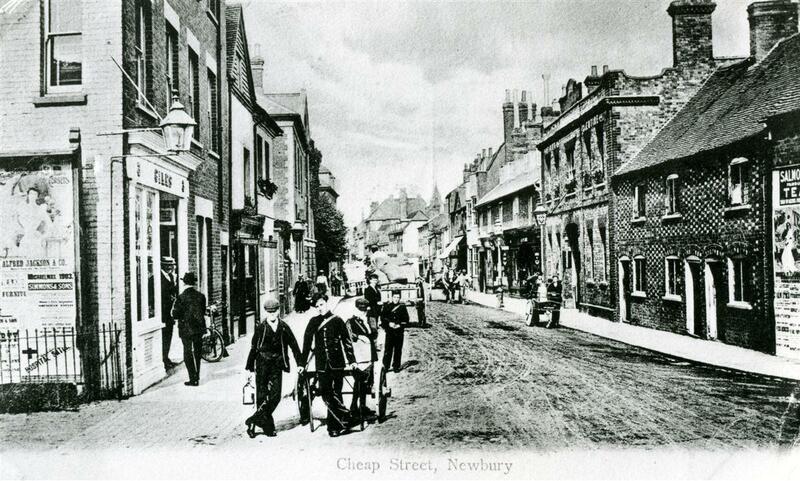 Charles remained in Newbury marrying Dorothy Shailes in 1925 – he died in Newbury in 1961, aged 60. Francis George Crosswell was not so lucky, he was conscripted immediately following his 18th birthday and joined the army on 14 August 1916. However, he was not immediately called upon to wear a uniform; the process was to ‘attest’ recruits and post them to the Reserve. They would then await the call to join a unit for training. So Francis returned to his work as a fishmonger’s porter until his call-up came ordering him to report for duty on 20 February 1917. He was sent to the 33rd Training Reserve Battalion (formerly the 13th Battalion, Royal Warwickshire Regiment) which became the 206th Graduated Training Brigade on 13 July 1917, at which time Francis was still with the unit. It was not long before he moved on, first to the 3rd Battalion, Wiltshire Regiment on 7 September and then to the Machine Gun Corps on 13 October. He sailed from Southampton, bound for France, on 23 December and landed at Le Havre the following day. On 30 December he was posted to 191 Company of the Machine Gun Corps; this company was attached to Divisional HQ of the 24th Division and became the part of the 24th Battalion, Machine Gun Corps on 3 March 1918. On 21 March 1918 the new battalion was holding the line Jeancourt – Le Verguier – Vadencourt when the enemy opened a heavy bombardment at 4.20am. The German Spring Offensive or Kaiserschalcht had started. Francis was wounded, shot in the hand and hip, on the opening day of the offensive as the Germans poured into their defensives, forcing a withdrawal along a wide front. Wounded men like Francis, who could not make their own way back were captured in their hundreds, along with many others who were cut off and surrounded by the rapidly advancing enemy. The War Office notified his family that Francis was ‘missing’ – a word that had become almost synonymous with ‘dead’ during the days of stalemate along the front. Of course prisoners were taken and every family had the hope that their loved one would soon send word from a PoW camp that they were well – but most were never heard from again. But the Spring Offensive was so overpowering in the opening days that huge numbers of prisoners were taken; to the familiy’s great relief a post card arrived from Francis on 23 August. He spent the rest of the war in Germany, recovering well from his wounds. He was repatriated in January 1919, arriving at Hull on the 12th. Given his experiences it is perhaps a little surprising that his next move was to re-enlist for a further 27 months service in the Army. However, the deal on offer was an attractive one now the war was over – he would receive two months home leave and a bounty of £20 (around £2,000 in today’s money). And, of course, it was peacetime wasn’t it? He re-enlisted in May 1919 and returned to duty following his two months leave on 22 July 1919. A month later he was on a ship bound for Murmansk the port supplying White Russian forces in northern Russia. He was back in a combat area – so much for peacetime service. By the time he landed in Murmansk on 25 August the days of the Allies intervention in Russia were almost at an end. On 4 October Francis was on his way back to the UK. The following February he left Devonport bound for India, where he served the remainder of his term in the Army with the 7th Battalion, Machine Gun Corps. He left from Bombay on 26 March 1921 and landed at Southampton on 18 April and left the Army on 12 July 1921. He moved away from Newbury and died in Oxford in 1955. Lad Drowned in Lock – A sad case of drowning occurred on Thursday afternoon last week in the lock of the Kennet and Avon Canal just above ‘First Bridge’, a lad of thirteen, Arthur J Crosswell, meeting his death. The lad is the son of a widow, living in New Square, Bartholomew Street, who has just had news of the loss of a son in France. At the inquest the mother stated that on Thursday afternoon the deceased told her he was going to the waterside, as he had a half-holiday, it being Ascension Day. She told him not to go there, but to go to the market. A soldier brought her the news that her son had been drowned. He (the soldier) said he had tried to save him but was too late. Frank Elliott, aged fifteen, said that when he fell in Crosswell was trying to get a piece of wood out of the water in the lock by means of a large knife to which a long string was attached, the method being to attempt to harpoon the wood with the knife and pull it in with the string. PC Robey stated that he and the witness Elliott dragged the water from the inlet end, recovering the body about four yards from there in a depth of from six to eight feet. There were thick weeds and rushes at the spot. The jury returned a verdict of “Accidently drowned.” The expressed their sympathy with the mother and surrendered their fees for her benefit. The coroner associated himself with the expression of sympathy.